The Bluesky Pension Scheme (Bluesky) is a non-profit arrangement and one of the largest Master Trusts in the UK. Bluesky completed the Master Trust Assurance Framework (AAF02/07) in December 2015 and as a result of this features on the Pensions Regulator’s list of approved Master Trusts. In addition, Bluesky is an Auto Enrolment qualifying workplace pension scheme. Operating for over 30 years, Bluesky is the chosen pension scheme for many industries and partnerships covering over 1 million employees and prides itself on innovation and value for money offering Target Date Funds as a member default and the opportunity to drawdown pension benefits in the UK’s first Trust based drawdown scheme, Crystal, operated by Evolve Pensions UK Ltd. Any employer is able to join Bluesky using the automated SUN (Sign Up Now) process and there is a beneficial no cost option to join for partnership employers. More Information Find out more about the life assurance benefit, including the importance of updating your nominated beneficiaries. Please note that Bluesky is a net pay arrangement, which means that pension contributions are deducted from earnings before they are taxed. If an individual does not pay tax, they will not benefit from the tax relief that a tax payer would. ✔ Help for employers at every step ✔ Guidance can be received via a helpline from our qualified staff. ✔ Pre-staging templates and wording that can assist employers in communicating with workers. ✔ Implementation planning. ✔ A review 4-5 months prior to staging. ✔ Technical assistance to generate the data files required ✔ 2 sets of test data checked ✔ Technical feedback and support. You can meet your Auto Enrolment needs and give your employees a high quality employment benefit by nominating the award winning Bluesky as your workplace pension scheme. Bluesky is operated on a non-profit basis by an independent Trustee Board who are advised by independent professional advisers. You can be assured that when you elect to use Bluesky that your employees are not paying for commissions and adviser fees. Members have access to live information about their Fund and Bluesky using a secure online tool, the Member Access Portal (MAP). When selecting a pension arrangement, you should satisfy your clients that their employees are subject to fair, transparent charging which represents good value for money. High charges can severely erode employees’ pension savings. Bluesky can be operated at no cost to the Employer and with total member charges starting as low as 0.4% pa.
As a member of a pension arrangement employees are investing their pension savings in line with the choices available. Pension arrangements with poor investment choices can severely affect the outcome for employees. Bluesky offers a wide range of investment choices including the award winning Target Date Funds. Further details of the investments on offer can be found on our Investments Section. Bluesky allows Employers to pay any rate of contribution on any definition of pay making it as flexible as your client needs. Please note minimum contribution rates apply under current legislation. See Contributions PDF. Is your client using another arrangement? Auto Enrolment refers to pension’s legislation which affects all employers in the UK. From 1 October 2012, all employers in the UK had to enrol all of their eligible employees into a qualifying workplace pension scheme and were provided with varying staging dates in order to comply. The last official staging date was 1st February 2018, however, with effect from 1st October 2017, new employers were no longer provided with a staging date, but instead have a ‘Duties Start Date’ which means that their Automatic Enrolment duties will commence on the contracted start date of their first worker. This is known as immediate duties. Your Duties Start Date is key as this is when the Automatic Enrolment duties start to apply to you. Compliance with the new legislation is compulsory and failure to meet the requirements may result in substantial fines. You can postpone your Auto Enrolment duties by up to 3 months. However you must communicate with your employees within 6 weeks of your original Duties Start Date to confirm that the duties are being postponed and to give prescribed information about the Auto Enrolment process. Your employees can elect to opt in to Bluesky during the postponement period however they would not be automatically enrolled. Other postponement options that can be used are up to 3 months’ postponement from employment date for new employees and up to 3 months’ postponement from the date that employees become eligible for Automatic Enrolment. These options may help to reduce your costs for short term or temporary staff but please be aware that employees have the right to opt in to the scheme at any time. You do not have to notify the Pensions Regulator (tPR) of your postponement decision in advance. Employees who are aged between 22 and State Pension Age who are earning over £10,000 pa. These employees will need to be automatically enrolled into a pension scheme and have contributions deducted and paid. Type 2 Employees that fall outside of the Type 1 age and earnings criteria will only need to be enrolled in to the pension scheme if they wish to join. Non Eligible Jobholders Employees who are aged between 22 and State Pension Age who are earning between £5,876 pa and £10,000 pa. AND Employees who are aged between 16 and 21, and State Pension Age and 74 who are earning over £5,876 pa. These employees are not automatically enrolled but can elect to opt in to the pension scheme and have contributions paid. Entitled Workers Employees who are aged between 16 and 74 and are earning less than £5,876 pa. These employees are not automatically enrolled but can elect to join a pension scheme, however employers are not required to contribute. Two sets of test data prior to staging, in an agreed format. Full ‘live’ data at your Duties Start Date and prior to every subsequent payroll. Contribution information after every payroll to confirm the actual deductions from pay, in an agreed format. Contribution payments should be sent by BACs, cheques will not be accepted. Write to each of your Employees – You must do this within 6 weeks of your staging date One of your immediate duties is to write to each member of staff telling them how Automatic Enrolment law affects them, for example, whether they’ve been automatically enrolled, or that Automatic Enrolment has been postponed for them. You must do this within certain time limits, within six weeks of them being enrolled, or within six weeks of your Duties Start Date if you’re postponing. Enrolling Type 1 Staff (eligible jobholders) – You will have a maximum of 6 weeks Once you know who you need to automatically enrol (section – Know your workforce), you will need to provide Bluesky with specific information to commence their membership (section – Getting your scheme up and running). If you have postponed Automatic Enrolment from your Duties Start Date, you will need to assess the ages and earnings of each member of staff on the last day of the postponement period, to see who is eligible for Automatic Enrolment. You will have six weeks from the end of the postponement period to automatically enrol any staff who are eligible. If you have not postponed, you will need to assess the ages and earnings of all staff on your Duties Start Date. You will need to automatically enrol anyone who is eligible within six weeks. Keep records of who you have enrolled. You will need to tell tPR how many you have enrolled into which scheme at registration. You must not say or do anything that could be viewed as influencing any of your staff to opt out of your pension scheme. This is referred to as ‘inducement’ which is a breach of the law and could result in fines. The Declaration of Compliance is the legal requirement to submit information to tPR about how you have complied with your Automatic Enrolment duties. If you do not provide the information required, you may face enforcement action and incur a fine. Your registration deadline is five calendar months from your Duties Start Date, even if you decide to use postponement. You need to provide the information online using your Government Gateway ID. You will need to provide information like the details of the pension scheme you have used for Automatic Enrolment and how many people you have automatically enrolled into it. Even if you have not automatically enrolled anyone, you will still need to complete the Declaration. Make sure you know what these records are and where to get them from. You will also need to decide how you will store them so you can easily access them. Keeping records is good governance and is proof that you have carried out your duties. These records must be kept for a specified time, which in most cases is six years. 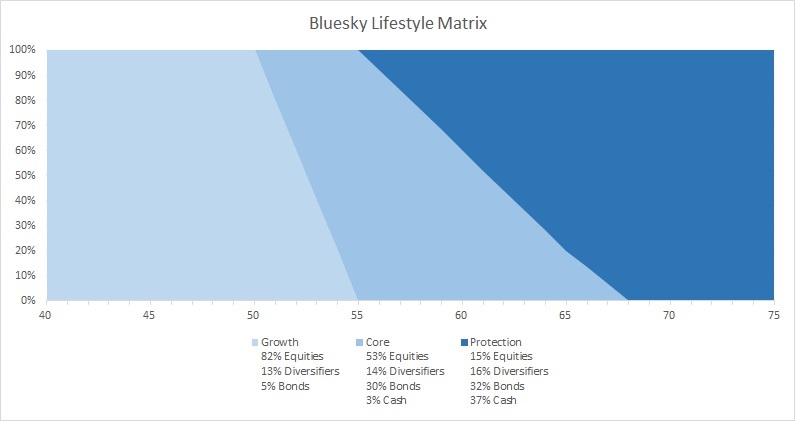 Bluesky offers first class investments allowing members the choice of a market leading default investment strategy, Target Date Funds, or a carefully selected and monitored range of self-select funds. Target Date Funds are a series of funds tailored to a member’s retirement date. 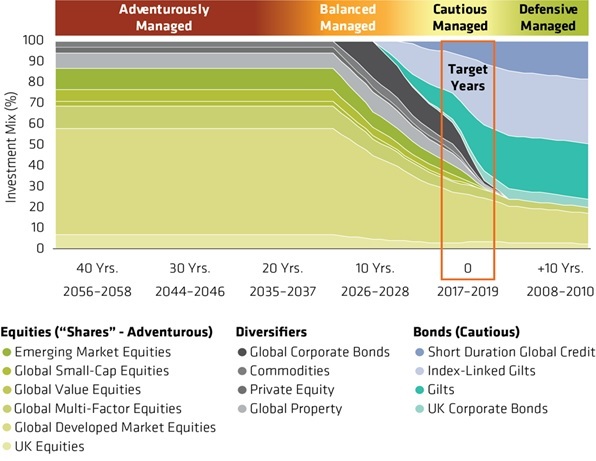 Each Target Date Fund is a diversified investment fund, which adjusts with age and proximity to retirement. It aims to give the highest possible pension income with a high level of risk management. Blueskys’ award winning Target Date Funds are provided by AB Global, who oversee the strategy ensuring that the mixture of assets is appropriate to the investment markets on a daily basis, using the Mobius Life investment platform.online tool, the Member Access Portal (MAP). The lifestyle strategy is provided by Legal & General Investment Management (LGIM), a global leader in passive investment management. It is designed to automatically manage members’ investments, with an aim to start protecting their funds from the age of 50 up to the age of 75. The chart below outlines the overall strategy, which is appropriate throughout an individual’s period of saving. The lifestyle strategy does not contain traditional lifestyling to align a member’s investments to a specific retirement age, normally 65, with no further strategy beyond that point. It is designed to maximise investment growth in the member’s early years, then gradually switch into other asset classes to reduce exposure to the stock market. With working patterns changing and retirement ages variable, the lifestyle strategy allows members the freedom to access their savings anytime from age 55, in the knowledge that their investments are continually monitored and adjusted, up to the age of 75. Have an old scheme sitting in the background? The Trustee of Bluesky acknowledges that some of the largest financial burdens can be felt immediately after the passing of a loved one. Joint bank accounts are often frozen in the event of a spousal death and costly funeral arrangements need to be made in a timely manner. 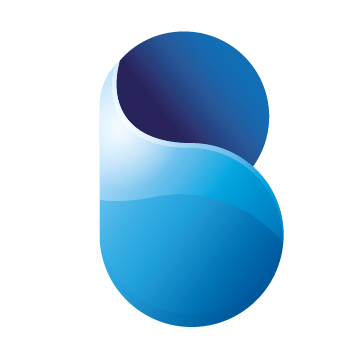 For this reason, the Trustee provides a no cost Life Assurance benefit, 15LC to every member of Bluesky as part of their active membership via the Bluesky Life Assurance Trust (TBLAT). 15LC grants the nominated beneficiary of any actively contributing Bluesky member that has passed away under the age of 75, a tax-free lump sum of £1,500. Members are required to ensure that their nominated beneficiary is kept up to date to guarantee the 15LC benefit can be paid as quickly and efficiently as possible. This can be done either by logging into their Account via the Member Access Portal (MAP) and updating it online, or by completing the ‘15LC Nomination Form’ held in the Scheme Information section on the MAP.